It's the Spring Wedding show today, April 30th, at The Drake hotel! Come visit Coriander Girl and all the other extraordinary vendors between 10am and 4pm! Speaking of weddings, did you watch William and Kate's wedding this morning? It was spectacularly hopeful and made my heart really really happy. What a thrill to be able to watch such a historical event! We love our lil' Easter bun bun. I'm grateful for the boat loads of love in my life. I'm grateful for my little shop of flowers. I'm grateful for friends who show me unconditional love even though I haven't been there for all the triumphs in their lives lately. I'm grateful for sunshine and even for the rain as it encourages more springtime bloomage. I'm grateful for our littlest doodle, Harry Hogan. I'm grateful for this magnificent fellow beside me, he's one amazing human to have by your side. And I'm grateful for you dear reader, it's really rewarding writing my little blog. Is anyone else down in the dumps? I don't have any reason to be. It's literally this crap weather we've been having. I wanna pull the blankets up over my head and hide away from it all. The work is piling and I'm staying on top of it but you know that feeling, when you're dangerously close to dropping the ball. I'm not gonna drop my ball, I'm gonna keep makin' three pointers from centre court and I'm gonna retire my jersey one day as a hall of famer. The sun just has to come out. I'm like the opposite of a vampire! I wither with every passing cloud. On a more positive note, change is upon us. The shop is looking lovelier than ever and I'm hopeful that spring really is just around the corner. I need a dance! Here's a nice one. And yes, that is Robin Williams. It's City Cottage, the dearest little doodle shop in Bowmanville and if you haven't been there you must make the drive! Jenny is as darling as her shop and has a real eye for vintage loveliness. She also has a wall o' pillows that she makes by hand and sells for a song! Check out her fabulous blog! Simple Casual Living. Jenny has been an incredible supporter of my shop and so many others, thank you Jenny for the time and energy you put in to supporting women in business all across Ontario and beyond! 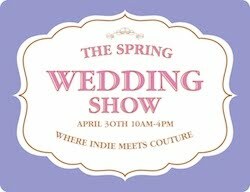 Coriander Girl will be at The Spring Wedding Show! For all those brides out there who are looking for something a little less conventional, The Wedding Co. is hosting The Spring Wedding Show at the Drake Hotel on Saturday, April 30 from 10am-4pm! Coriander Girl will be there so be sure to come by and say hello! You might even get to meet the amazing Catherine Lash! A lovely new friend of mine is responsible for this darling little piece. Her name is Virpi and her talents blow me away! Les Pansements from Virpi Kettu on Vimeo.